The guests at Casa Escondida Bed & Breakfast always find their visit to The New Mexico History Museum to be a fun and fascinating Santa Fe vacation activity. Casa Escondida is a Santa Fe area B&B, which is located in historic Chimayo, NM (just 35 minutes north of Santa Fe). During your visit to The New Mexico History Museum, you will find everything from ancient artifacts to computer interactives. Currently, the main hall hosts the “Telling New Mexico: Stories from Then and Now” exhibit. This exhibit covers 500 years of New Mexico history (Native peoples, Spanish colonists, Santa Fe Trail riders, outlaws, the railroad, artists, scientists and yes…..even hippies)! 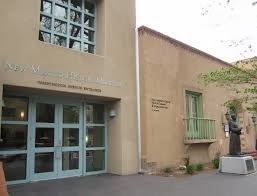 The New Mexico History Museum is located on the historic plaza in Santa Fe, within the “Palace of the Governors”, which itself is a National Historic Landmark (built in the early 17th century). Under the portal (covered porch) of this building, you are also able to meet Native American artists. 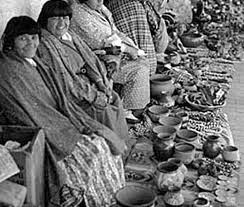 Here, each day they display and sell their authentic, handcrafted works of art (jewelry, pottery, weavings, baskets, sand paintings). Casa Escondida B&B guests can visit the New Mexico History Museum from 10 AM – 5 PM, Memorial Day – October 7th (closed on Mondays the rest of the year). Enjoy their extended hours on Fridays, until 8 PM, May – October (only on the 1st Friday of each month November – April). Entry is FREE to all from 5 PM – 8 PM during the extended hours. Regular admission is $9 for out of state visitors and $6 for New Mexico residents (FREE all day on Sunday for New Mexico Residents). The New Mexico History Museum is located at 113 Lincoln Avenue. So when you wonder what new and wonderful things there are to do in New Mexico, put the New Mexico History Museum on your list. This is a wonderful way to experience this New Mexico vacation spot. Casa Escondida Bed & Breakfast is a delightful New Mexico retreat, which has rooms available year-round. We are perfect for a romantic New Mexico getaway too. Contact Casa Escondida B&B to check room availability or to inquire about a reservation. Casa Escondida Bed &Breakfast is a green bed & breakfast, which provides Santa Fe area pet-friendly lodging in 4 of our 8 guest rooms. 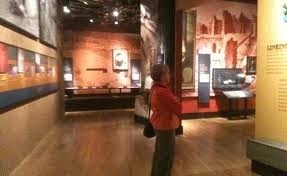 Enjoy your New Mexico travels, Casa Escondida Bed & Breakfast and the New Mexico History Museum! We look forward to having you as our guest!